When we think of the name Douglas we usually have in mind Oscar’s golden lover-Boysie of that ilk—we do not necessarily conjure up visions of the rugged American screen legend, Kirk Douglas. But today there are two reasons why we should. First, it is actor Kirk‘s 100th birthday; so congratulations to him. Second, it’s difficult to imagine the lordly Alfred, that over-privileged lily of lilies, ever having appeared in the guise of an enslaved gladiator—and we need to focus upon that as therein lies our theme. So we turn to Kirk Douglas and perhaps his most famous role as Spartacus in Stanley Kubrick’s film of that name. And perhaps the most famous scene in the film is the epic show of solidarity when each of the recaptured slaves in turn claims “I am Spartacus” thus forgoing leniency in exchange for the same fate of crucifixion as their rebel leader. 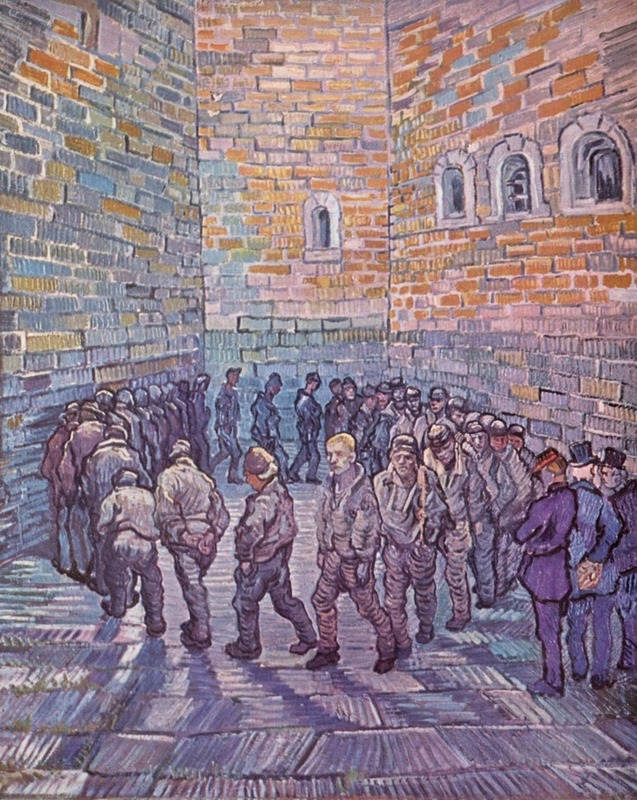 …You must know that in prison one has but an hour in the sunshine, that is, one marches around the yard in a circle, one after the other, and is forbidden to say a word. One is watched, and there are dreadful punishments if one is caught talking. The novices, who are in prison for the first time, can be distinguished by their inability to speak without moving their lips. For ten weeks I had been there, and had not spoken a word to a soul. One evening, just as we are making our round, one behind the other, I suddenly hear my name spoken behind me. It was the prisoner behind me, who was saying: ‘Oscar Wilde, I pity you, for you are suffering more than me.’ I made the greatest efforts not to be observed, and said, without turning around: ‘No, my friend; we all suffer alike.’ And on that day I did not think of suicide. He could not understand! He was very much embarrassed. ‘But I have already given him fourteen days…” and then: ‘Very well! If this is the case, you simply both get fourteen days.’ Splendid, that, eh? The man simply had not an atom of imagination. Naturally, after the fourteen days, our desire to talk was all the keener. You know how sweet is the sensation of suffering for others. Gradually—one did not always parade in just the same sequence—gradually I managed to talk with all of them! I knew the name of every single one, his story, and when he would be leaving prison. And to each I said: The first thing you are to do when you come out is to go to the post-office; there will be a letter there for you with money. There were some splendid fellows among them. Will you believe me if I tell you that already some three of my fellow prisoners have visited me here? Is that not wonderful? Recollections of Oscar Wilde, by Percival Pollard, Ernest La Jeunesse, André Gide, Franz Blei. Published 1906. 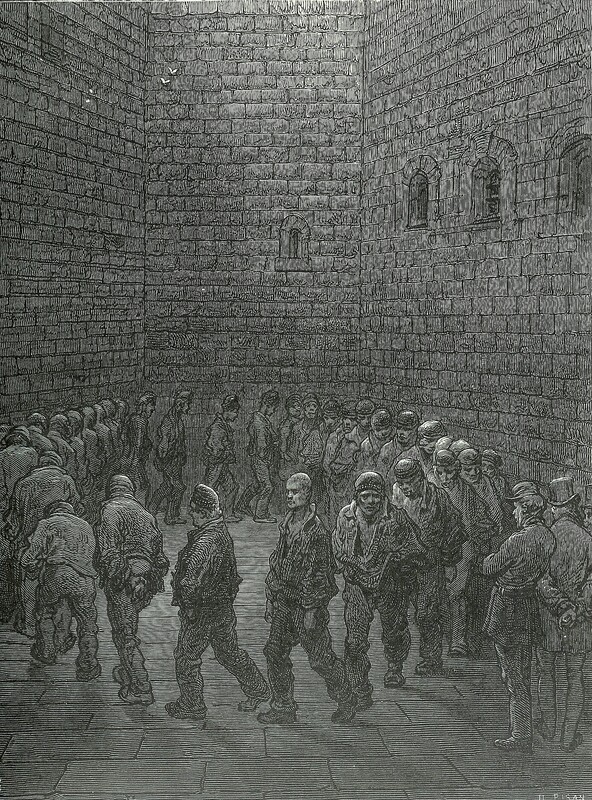 1) Prisoners in the Exercise Yard at Newgate Prison, Gustave Doré, 1872. 2) Photographs of prisoners in Reading Gaol before their discharge or transfer © Berkshire Record Office. Best to you and all who sail in you!